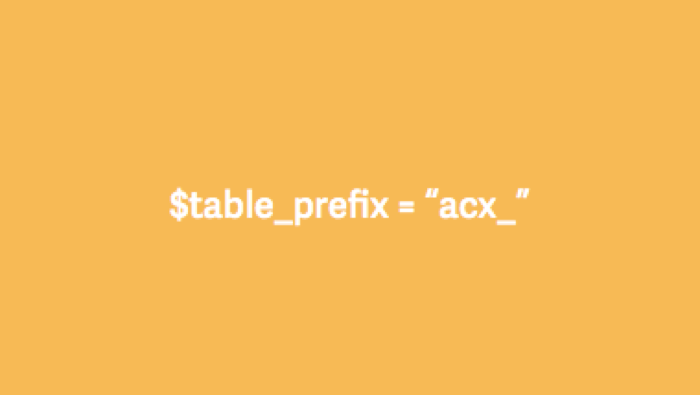 ActiveCollab has always prefixed its tables with "acx_", or a different value that the user specified during the installation. The reasons for this are purely historical. When ActiveCollab was originally created, it was pretty common that you got a hosting package with a limited number of MySQL databases. Some packages even limited users to just one database. This forced users to install multiple applications in a single database, so all of the applications had to "namespace" their tables with a prefix. For example, if application #1 had a "users" table, another application couldn't have a table with that name unless they put a prefix in front of it (app1_users and app2_users). For that reason, pretty much all PHP apps that you could self-host had a prefix - phpBB "phpbb_", WordPress "wp_", ActiveCollab "ac_" or "acx_" etc. The time to retire the table prefix in ActiveCollab has come with version 5. Now that VPS plans are so common and affordable, you're the one controlling your platform and you can create as many databases as you want. Even most shared plans (which we don't recommend) provide an unlimited number of databases. So it's time to move on. The new ActiveCollab will require that you prepare one empty database, which the app can then fully manage. Even if you'll be upgrading, a clean database is required for the migration to work. The upgrade script will move your ActiveCollab 4 tables to the new database, and automatically remove the table prefix along the way. It'll also make sure that your tables are using a modern storage engine and character set. The end result is one less thing to worry about. We prefer to focus on stuff that actually matters (user experience, performance, features, etc.) instead of dealing with a limitation enforced by strange hosting practices of the past.